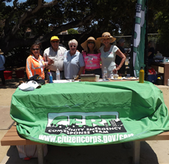 CERV hosted a community potluck event at Casanova Oak Knoll Park Park. It was attended by 33 CERT volunteers. It was a gorgeous day with wonderful gourmet food. CERV raised about $200.